Sometimes you don’t have the time to roll, and rolling joints can be tricky and tedious if you have never done it before, so let us do the rolling for you! Perfectly packed in a reusable doob tube and rolled with Raw Classic King-Sized Cone rolling papers! Pure and less processed rolling papers unlike anything that you have ever seen or smoked. It contains a hybrid blend of unbleached fibers making the paper a translucent natural light brown color. Raw rolling papers are watermarked with a patented CrissCross watermark. This special watermark helps prevent runs and maintain a smooth even-burn. Sour Russian is an indica dominant hybrid strain created by crossing the hugely popular Sour Diesel X White Russian strains. This dank bud boats a myriad of both indica and sativa effects. Sour Russian has a distinct aroma of sour tangy fruit and a taste of tangy fruit with a sour pine aftertaste upon exhale. 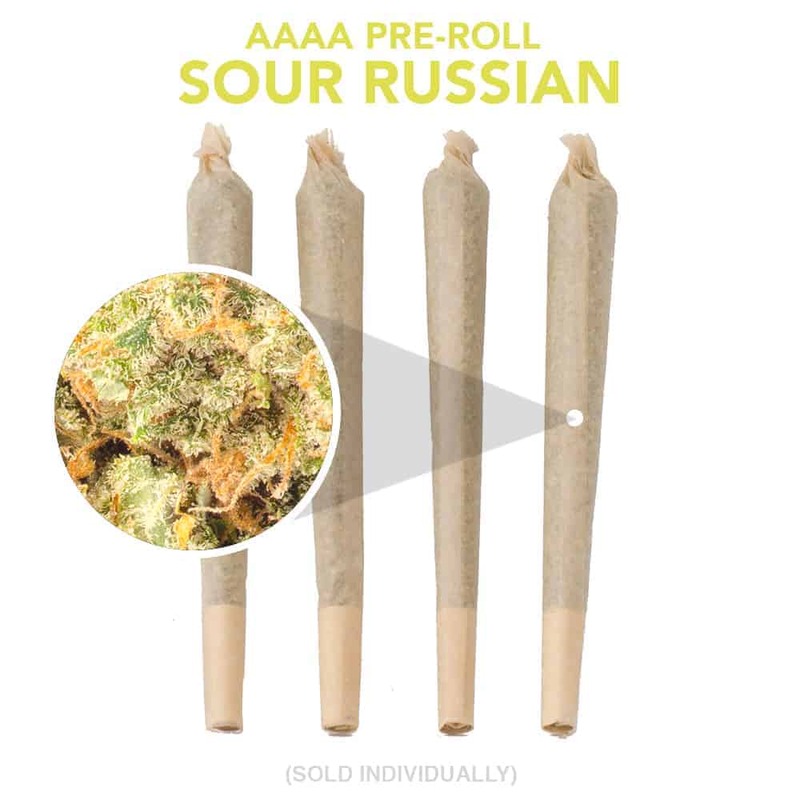 Users describe the Sour Russian high as one with a strong immediate head high that is felt in the back of the neck and behind the eyes. This is followed by a warming body buzz that slowly spreads throughout the body, leaving you utterly relaxed, couch-locked, and with a moderate case of the munchies. Upon the come down you’ll be eased into a peaceful uninterrupted sleep. Due to these potent effects, Sour Russian is an ideal strain for treating patients suffering from insomnia, chronic pain, and appetite loss.